The words used to motivate us all to continually strive to improve things for children, in which ever society or community we live in, were those used by Mrs Liew Sau Pheng, founding member of the Malaysian Child Resource Institute, in a truly inspiring speech to close a half-day workshop I ran in Kuala Lumpur this week, supported by the British High Commission. Mrs Liew’s lifetime of work dedicated to children’s advocacy, child protection and the improvement of early education of children demonstrates what a committed, passionate and tenacious person can do to make things better for those people who may not have a voice for themselves. 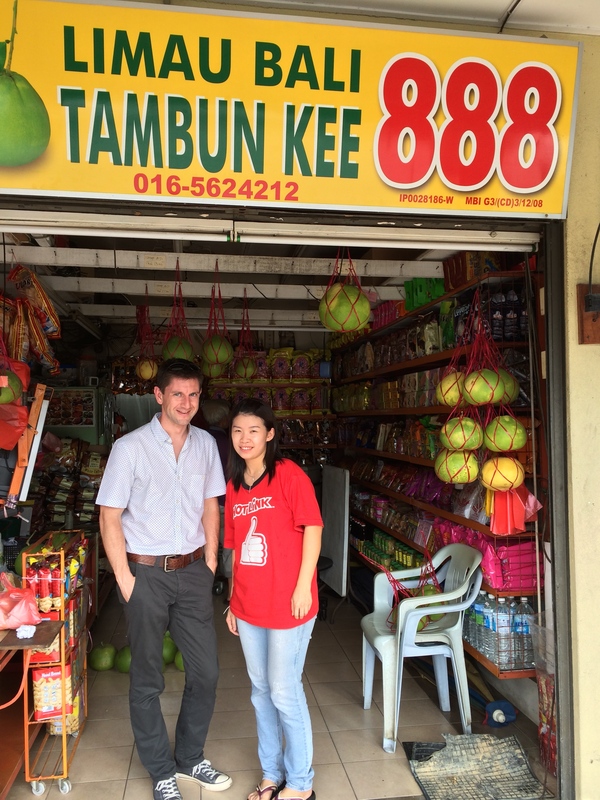 I’m grateful to the Association of Paediatric Emergency Medicine for the grant that they awarded me which has part-funded the Malaysian component of this project in Kuala Lumpur and Ipoh, Perak. In a week where a two year old child was abducted from a shopping centre and beheaded beside the river in Kuala Lumpur, and a fifteen year old girl was allegedly repeatedly sexually assaulted by anywhere up to 38 different men in the north of the country, violence against children here in Malaysia is again in the media headlines. 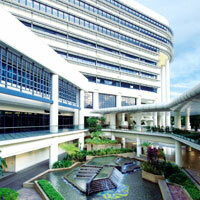 So prevalent are the crimes against children and vulnerable adults here that the Emergency Department (ED) at Hospital Kuala Lumpur (HKL) has a dedicated OSCC situated in the ED with easy access to the hospital’s SCAN team. I have spent the week trying to find out how child protection cases present to emergency medical services here, with a particular focus on child sexual exploitation (CSE) cases, how these cases are recognised and how they are investigated and managed. The ED is incredibly busy, seeing in the region of 400-500 children per day out of a total attendance, each day, of 1500 patients. Yup, my jaw dropped as well and I thought I’d misheard but I hadn’t. The vast majority of these patients self-present with very few of them (<10%) coming by ambulance, reflecting the work-in-progress nature of the emergency ambulance service in Kuala Lumpur. In the Emergency Department the patients are triaged at a counter at the front of the department with a two-stage triage process in operation. A first “quick look” to detect those patients who need to rapidly move to the resuscitation room (or Red Zone as it is referred to) and a second, more comprehensive assessment of those patients who can wait a little longer and be seen in the Green Zone or Yellow Zone. Although family medicine and primary care services do exist to a greater or lesser extent, it was clear that patients make their own decisions about which health care facility to access and they appear to be voting with their feet in favour of attending the ED rather than other services. The ED staffing levels have to be robust enough, both from a nursing and medical point of view, and the footprint of the ED has to be large enough, to accommodate such a significant number of patients each day but given the robust two-stage triage process in operation and the senior clinical input into the decision making of more junior medical staff, the absolute numbers of patients attending per day is not a barrier to the provision of good quality care. 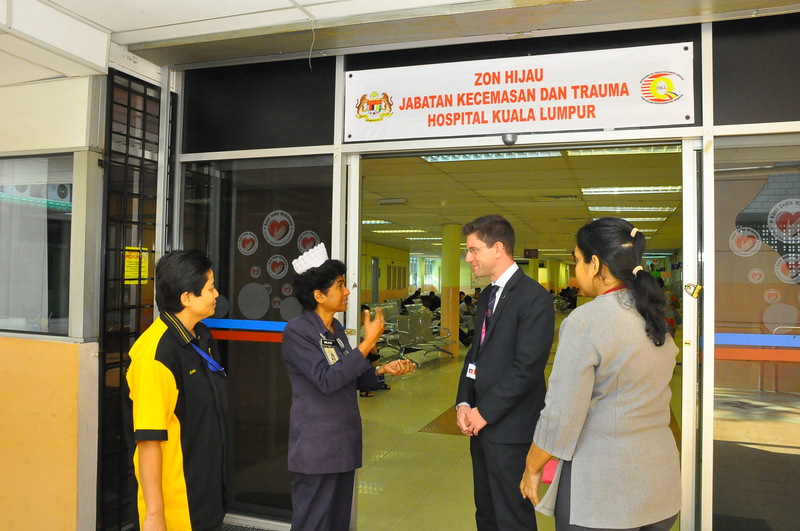 The charging system for patients attending the Emergency Department is simple – if you are a Malaysian citizen you pay 1 Ringgit per attendance (30 US cents) and if you are not then you pay 50 MYR per attendance (15 USD). Therein lies an issue though – there is an immigration department within the Emergency Department with each patient having to prove their citizenship. At the end of last year our own government made clear its widely reported views about provision of healthcare to overseas visitors. Someone’s immigration status should have no bearing on whether they are able to be provided with emergency healthcare treatment and it remains my view that we must not go down this road in the UK otherwise, as has been seen here on occasions, children (both medical and trauma – including child abuse cases) , sick elderly people, and others who are worried about arrest, as has happened, at the hospital if they try to access healthcare but cannot show that they are in the country legally, with suffer the most and this will drive underground a problem which very much needs to be kept firmly in the open. The OSCC centre is a fundamental part of the emergency department and works closely with the obstetrics and gynaecology staff as well as the SCAN team to help investigate and manage those patients who present to the ED following alleged crimes against them. It is a sad, but real, state of affairs that one of the first posters seen on entry to the OSCC is the one advising everyone that there is an alternative to ‘baby dumping’ (as it is called here by the staff) which will result in death if the babies are not found quickly enough. 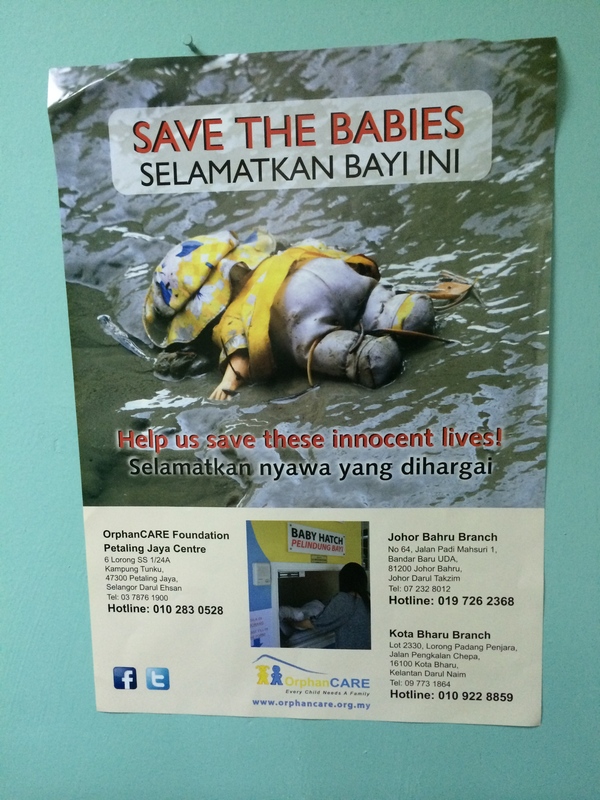 There are an increasing numbers of babies left in waste dumps, bushes, drains and public toilets here in Malaysia. Unmarried mothers or victims of sexual assault who abandon their babies are mostly young and come under pressure arising from social stigma and legal implications, compounded by a sense of hopelessness due to not knowing whom to turn to. The baby hatch hopes to change that by providing an outlet for those women who face such pressure; an outlet designed to save the live of their babies who may otherwise, quite literally, end up on the rubbish dump. That list is very female focussed and it is important, along side that, not to forget that boys can be sexually exploited as well as girls. Secondly it is important to be aware of some of the presenting features which should cause the clinician to think more closely about the presentation and I’ll be coming back to these in my full report. The purpose of my visit here was to learn from the emergency department and child protection teams and to see how we could apply that learning back in the UK. Turning the (very heavy) resources I’ve been provided with this week as well as my notes and observations into something more structured than this report is something I’ll be doing when I get back to the UK and I aim to have this completed by 31 October 2014. In exchange for hosting me this week I’ve lectured at HKL, designed and delivered a half day training workshop at HELP University and taken part in a round-table discussion in Ipoh. It never crossed my mind when I agreed to do this teaching that afterwards I would receive a phone call to say that the Cabinet Minister in charge of the Ministry of Women, Family and Community Development (Kementerian Pembangunan Wanita, Keluarga dan Masyarakat – KPWKM) the Honourable Rohani binti Haji Abd. Karim, Y.B. Dato’ Sri had cleared a 10-15 minute slot in her diary, before giving the closing speech at an event held at a University outside of Kuala Lumpur, to discuss what could be done to improve child protection in Malaysia and I would be going along to meet with her. The short discussion turned into a 75 minute meeting, and the closing ceremony had to be postponed, as it was clear that everyone present was incredibly keen to find a way to improve the plight of children who are at risk of abuse or who have suffered from abuse, both detected and un-detected. The only down-sides to this meeting were that the ticket I’d bought to go up the Twin Towers, on what was supposed to be my morning off, was not able to be used and I may now need to investigate the excess baggage fees on Malaysia airlines thanks to the extreme generosity of the Honourable Minister in providing me with several gifts, on behalf of the Government Ministry, as a way of welcoming me to Malaysia and saying thank you for the teaching and input I’d given during the week! 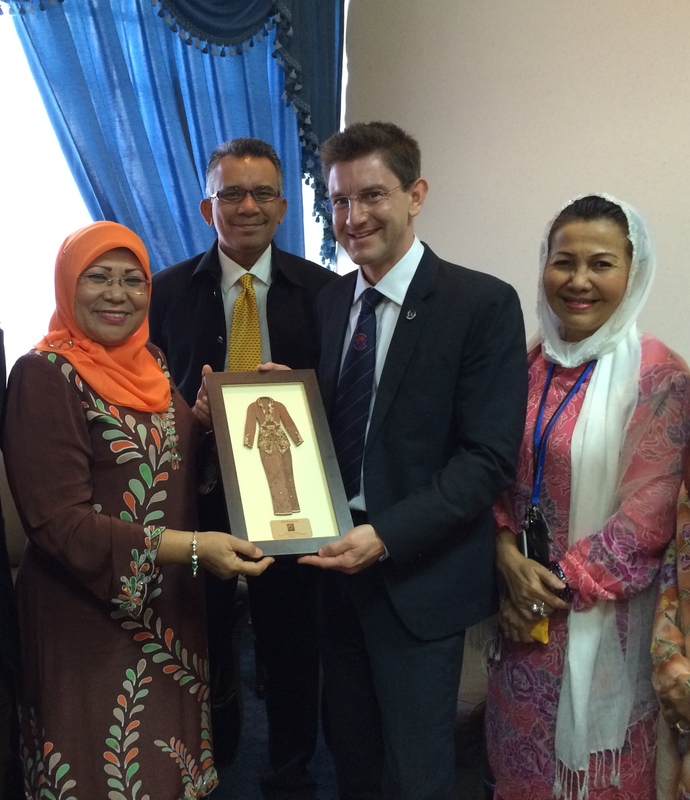 I’ve seen some incredibly devoted staff, both in Kuala Lumpur and Ipoh, who are passionate about protecting children and are continually going the extra mile to bypass barriers which appear to be continually obstructing professionals from carrying out a role that is so vitally important – protecting children. Robust laws covering child abuse already exist in Malaysia but still I have seen and heard, from professionals and families alike, that there continue to be real problems with the child protection system here. Inter-agency communication is not optimal; departments appear to be working within the law but with often completely separate operating procedures; families are sometimes dissuaded from making police reports about crimes, and potential crimes, against children; the processes by which cases are investigated and children are dealt with are inefficient and not coordinated in a number of areas. It is for these reasons that I propose there needs to be implementation of a two-phase project in a pilot region, with a full evaluation after 12 months of operation, designed to improve inter-agency working and improve the efficiency and standardisation of the investigation of alleged child abuse cases. The first phase should be the creation of an expert panel, with a Malaysian majority and International Input as necessary, to direct the setting up of a Multi-Agency Safeguarding Hub within the region and the second phase should be the design and cascade of a standardised multi-agency training strategy and programme aimed at all professionals working with children and families in health, education, social work, welfare, law enforcement and the judicial system. But what about the hope that I referred to in the title of this update? The hope I have is that the dedicated staff I’ve come into contact with will not be put off or beaten by the organisation treacle which will have to be waded through until the organisations as well as the individuals are ready for real change, at a grass roots level, which will help protect children better. I’m hopeful, because I have seen the passion in the professionals that I have come into contact with, and I hope that they will continually jump over whatever hurdles are placed in front of them, in a multi-agency way, to improve things for children. And I’m hopeful because I have seen examples of where the system does work and can work again in the future – but these examples are all dependent on individuals so it really is important that if this hope is to become a sustainable reality organisational silos must be joined together so that everyone working to protect children, no matter what their background, their profession or their department, is working to the same procedures, the same rules, the same assessment framework and with the same high levels of empathy, efficiency and enthusiasm that the children and their families deserve. I leave Malaysia tomorrow feeling that I think I will be back here before too long and when I do return I should be more used to the humidity and propensity for a large amount of water to fall from the sky with a moment’s notice! With only two destinations left before I treat myself to a final few days holiday, I’m sad to say it won’t be long before my travels come to and end and I have to return to the UK. Next week I’m travelling to Cambodia to see the amazing work being undertaken by Maggie Eno MBE and her team at M’lop Tapang protecting the street children living in and around Sihanoukville. I met Maggie earlier this year when I presented at the Child Exploitation and Online Protection regional workshop so I’m really delighted to be able to meet up again and to spend some time with her and the mobile medical team looking at the work they are doing. But before that I’m off to devour the Pomelo, currently sitting in my fridge, which was very kindly bought for me by my driver, Siva, today after my own abortive attempt at distinguishing between the sweet and the “I’m sucking on a very bitter lemon” variety! Having swapped BST -7 hours for BST +7 hours in the space of 24 hours… which I think means I moved 14 hours ahead of where I was last weekend (although it might have been easier to move 10 hours behind!) its taken me most of the week to work out what planet I’m living on. I’ve just finished my first week in Singapore – at the KKH Women’s and Children’s Hospital Paediatric Emergency Department. 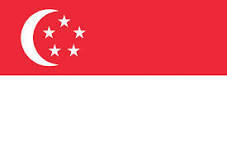 Singapore is an amazing city – really safe, impeccably clean, extremely efficient and very friendly. 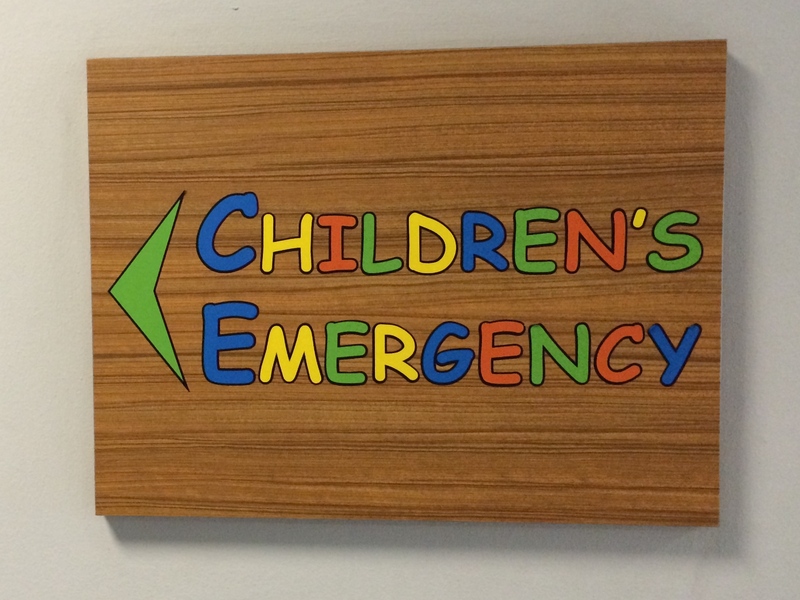 The children’s emergency department here is a model of efficiency – and, to be honest, it has to be. The emergency department sees over 170000 children per year – that is just under 500 children per day. To put this into context, the department I work in sees approximately 75 children per day and the busiest single children’s emergency department in the UK sees around 60000 patients per year (about 200 per day). So, how do they manage to run a department so busy here in Singapore? The answer to that is an incredibly efficient process with staff having clearly identified roles and responsibilities, everyone being dedicated to ensuring the department functions at an optimum level and a strong educational and research programme to ensure standards are always being advanced. There is a senior doctor resident on-duty 24 hours a day with sufficient junior medical staff to ensure that patient flow continues and there is strong senior clinical leadership in the Emergency Department to ensure that more junior staff always have access to a senior opinion. 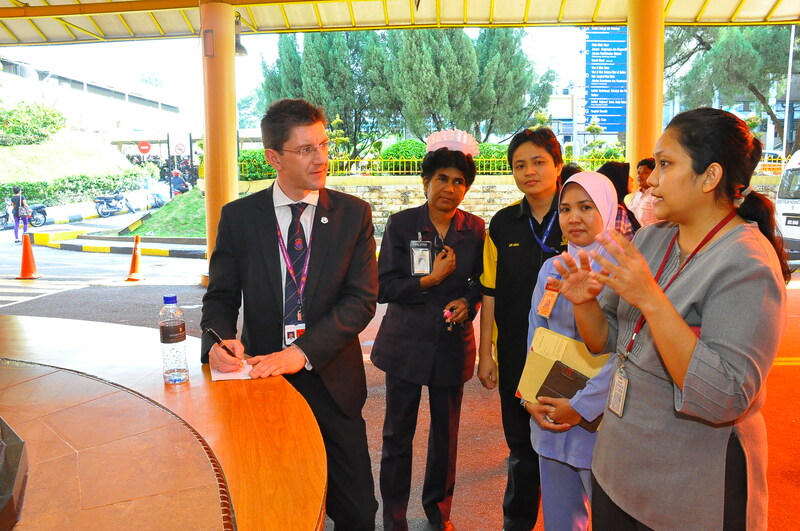 One of the things that particularly impressed me about the functioning of the department was the two-stage triage process and the speed and efficiency with which the nursing staff are able to screen children for potential serious illness or injury (there are four triage nurses at any one time – and the patients are triaged before they register to ensure there is no delay in assessment). The Information Technology system that is used by the Emergency Department was self-designed by the staff there and now contains a database of around 1 million records – making it a fantastic resource for potential research in the future, particularly looking at one of my other areas of interest (the development of early warning or track and trigger scores to assess illness severity in children presenting to emergency departments). The departmental staff were very welcoming to me and I had the opportunity to speak to many members of the multi-disciplinary team, to teach the medical staff and medical students and spend a significant amount of time in the clinical areas of the department and the resuscitation room (which is very busy!). The Head of the Emergency Department and I will both be travelling to Hong Kong in a few weeks time where we will be delivering educational sessions at an International Conference. I feel that this week has been an excellent opportunity to develop the early stages of future collaborative work between the children’s emergency department here in Singapore and the various departments back in the UK and I’m very much looking forward to continuing those discussions in Hong Kong and beyond with the hope that we can set something more formal up in the not too distant future – this can only be of benefit to staff working in emergency medicine as well as the patients and families they treat (both here in Singapore as well as back in the UK). At the end of this week I had the opportunity to deliver an hour-long presentation at the Ministry of Social and Family Development discussing child protection and how it relates to emergency medicine in the UK as well as how we can change practise to try to ensure that the more subtle cases of child abuse are not missed and are picked up at an earlier stage. After talking for an hour and then taking part in a round-table discussion for over an hour and a half (which basically involved me being questioned by the staff) we had really started to delve into some of the really key issues which are involved in protecting children in Singapore and the parallels, as well as differences, with the UK system were very interesting to explore. The networking opportunities and multi-agency link-up that this week’s discussions have facilitated are going to be really useful and interesting in the future – I think this is definitely a case of ‘watch this space’ and I’m hopeful that some of the initial discussions we have started this week will continue and become more robust as we continue to explore future channels of communication. Last night I was treated to a splendid local banquet – of food I’ve never eaten before – so I leave Singapore, albeit it briefly, feeling very full, somewhat sticky from the humidity, and very pleased to have had such a successful week of work. Today I’m moving on to Malaysia for the first time where I will be spending part of the week in Kuala Lumpur and the remainder of the week in the North in Ipoh. The primary focus of this part of the project is going to be looking at Child Sexual Exploitation, what role emergency medical services can play in the identification of cases and what the barriers are to the identification of children who might be at risk of such harm. I’ll report back as the week unfolds! The first month of the project has drawn to a close! I can’t believe how quickly it has flown by. From starting in Austin, Texas a month ago I’ve been to Dallas, Paris, Phoenix, Philadelphia and Denver. I’ve seen at first hand the really excellent service, care and support provided by children’s advocacy centres; I’ve seen how multi-professional teams interact together, always keeping the interests of the child at the centre of everything they do; I’ve seen how the facilities and care provided in paediatric emergency departments compare with our departments back in the UK; I’ve seen the real benefit that hospital-based social workers can provide to the care of children who might be at risk of signifiant harm; I’ve been involved in more child protection cases than I ever would have expected to see in a very bad three to six month period back in the UK; I’ve had some incredibly rich educational experiences looking critically at the research surrounding many aspects of child protection and I’ve met and collaborated with some of the most eminent physicians working in the field of child abuse anywhere in the world. I’ve gathered a significant amount of evidence to help me form my own views on whether or not the UK should move to introduce Mandatory Reporting legislation but, before I declare my views on this, I need some time to reflect more deeply and to assimilate all of the research papers and professionals’ opinions that I have managed to obtain. Of course, no one system is perfect and in the interests of being balanced there are two particular aspects of the US medical and legal system that I still find difficult to understand. The first is the continual focus on costs, payment and insurance and the fact that, even in this day and age, in one of the most powerful countries in the world there are still many people living here in the US who cannot afford healthcare and do not have insurance cover to enable them to access the excellent standard of care that they deserve. Whilst the full implications of the Affordable Care Act are yet to be seen I remain concerned that right now, today there are a significant number of incredibly vulnerable adults and children who are uninsured and do not have the means to pay for the healthcare that they need. Of course, you could read the legislation yourself and make up your own mind. The second area of significant concern to me is the treatment of children within the legal system of the USA. Although I understand that the sixth amendment to the United States Constitution gives a defendant the right to be faced by their accuser and witnesses, there has got to be a better way of proceeding than having children, sometimes as young as two or three years old, appearing in the witness box, in a Court room, when they are alleged victims of horrendous child abuse. There has got to be a way that justice can be fairly carried out and that the rights of all parties involved in a case can be protected without making them appear in such a daunting environment unless this is what they absolutely want and have made an informed decision to do. Of course, in the UK we have special protection for children in family proceedings and vulnerable witnesses. I’m having a week’s vacation now so I don’t plan any updates until phase two of the project starts on 21 May 2014. That will have involved a very long trip half way around the world to Singapore and I’m really looking forward to seeing the similarities and differences, beginning in the Paediatric Emergency Department of their Women and Children’s Hospital. Until then, I leave the USA with fantastic memories, lots of ideas and grateful thanks to everyone here – their enthusiasm, support and kindness has been outstanding. And as for the food I’ve been provided with… I think it is entirely possible that I might just be turning into an enchilada. In 1962 Dr C. Henry Kempe and colleagues wrote their landmark paper on The Battered Child Syndrome which was widely regarded as one of the most significant events in creating awareness of child abuse. The paper provided clinicians with a way to understand such abuse but, crucially, to do something about child abuse and neglect. Dr Kempe founded The Kempe Center (originally called The National Center for the Prevention and Treatment of Child Abuse and Neglect) which opened in 1972 with the clear vision to recognise that children were being abused, to recognise that the threat to children’s safety was very real and to do something about it. Dr Kempe, and his wife Professor Ruth Kempe, worked jointly at The Kempe Center which is now recognised nationally and internationally as a leader in the field of child abuse and neglect. Developing and testing new programs to help children. 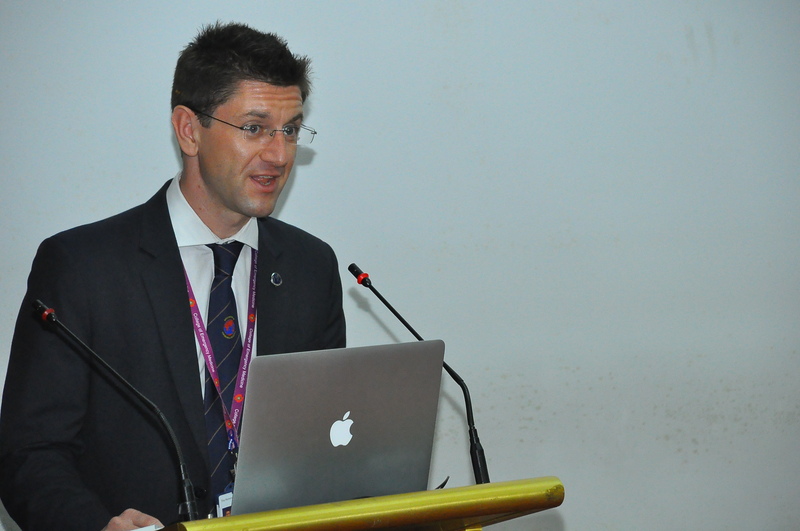 Dr Kempe also recognised that professionals would need the help of the entire community to end child abuse. The Kempe Foundation was established and community leaders, philanthropists and business people were called upon to spearhead fundraising and awareness and advocacy efforts in order to recognize and do something about child abuse and neglect. Of these 26.8% were under the age of 3 years, 20% were aged between 3-5 years, 21.3% were aged between 6-9 years, 17.4% were aged between 10-13 years and 14.1% were aged between 14-17 years. As the first half of my project draws to a close in the USA I’m delighted to be able to spend the week in Colorado at The Kempe Center where child abuse paediatrics began in the USA over 50 years ago. It is going to be particularly exciting for me to see the research that is being conducted in the Emergency Department in relation to child abuse, to learn what tools, protocols and education are in place to help professionals pick up cases of possible child abuse and to discuss my findings so far with eminent clinicians working in this field including to meeting with one of the editors of the internationally respected medical journal, Child Abuse and Neglect. The oxygen dissociation curve is a graph that shows the percent saturation of hemoglobin at various partial pressures of oxygen. The purpose of an oxygen dissociation curve is to show the equilibrium of oxyhemoglobin and non-bonded haemoglobin at various partial pressures. At high partial pressures of oxygen, usually in the lungs, haemoglobin binds to oxygen to form oxyhemoglobin. When the blood is fully saturated all the erythrocytes are in the form of oxyhemoglobin. As the erythrocytes travel to tissues deprived of oxygen the partial pressure of oxygen decreases. Consequently, the oxyhemoglobin releases the oxygen to form haemoglobin. Why is this relevant to me? Atmospheric pressure at sea level is 100kPa but at 3360 metres, where I spent time earlier this week in the Rocky Mountain National Park, the atmospheric pressure is only 67kPa (two thirds of that at sea level) with a corresponding reduction in the inspired oxygen pressure (13.3 kPa compared with 19.6 kPa). Put simply, I won’t be running up any stairs for the rest of the week if I want to avoid a headache, a feeling like my chest is about to explode, a racing pulse and a fast respiratory rate! That first year medical school respiratory physiology has finally come in handy, after all! The time I have spent at The Children’s Hospital of Philadelphia (CHOP) this week has been academically very stimulating. I’ve been working with clinicians who are real experts in their fields – many of whom have lectured and advised internationally and given evidence, as experts, in Court proceedings throughout the world. As with all of the other places I’ve visited so far, the welcome I have received here has been brilliant. 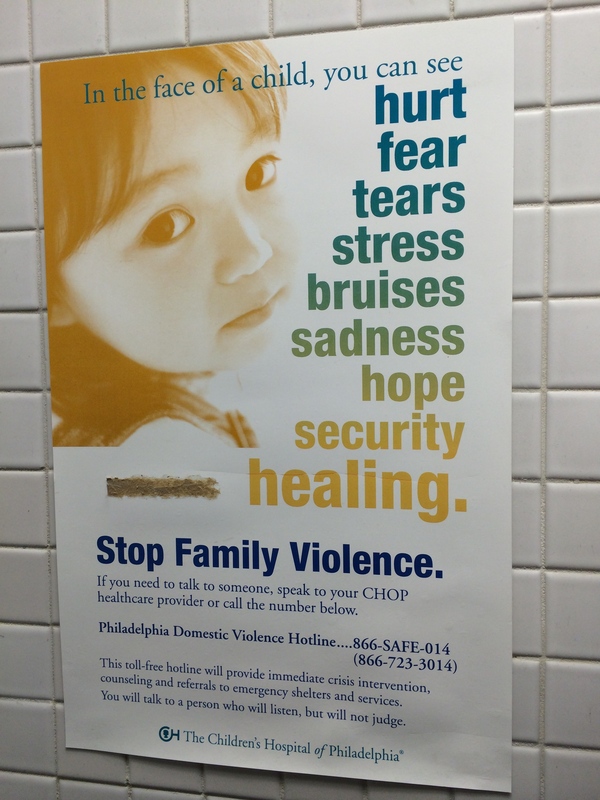 CHOP is one of the leading children’s hospitals in the USA and has earned the No. 1 spot on U.S.News & World Report‘s 2013-14 Honour Roll of the nation’s Best Children’s Hospitals. CHOP was also ranked in the top four for all 10 paediatric specialties surveyed. Only 10 children’s centres in the USA earned a place on the 2013-14 U.S. News Honour Roll. The chief executive of CHOP believes that, “this recognition is a tribute to the exceptional work of our staff and their tireless dedication to our patients”. I have seen at first-hand this week that dedication in action, a clear commitment to innovation and research and a multi-disciplinary team that functions efficiently and expertly as one unit, continually focussing on what is best for the patient(s) concerned. CHOP was the USA’s first children’s hospital and has a long history of innovation and excellence. 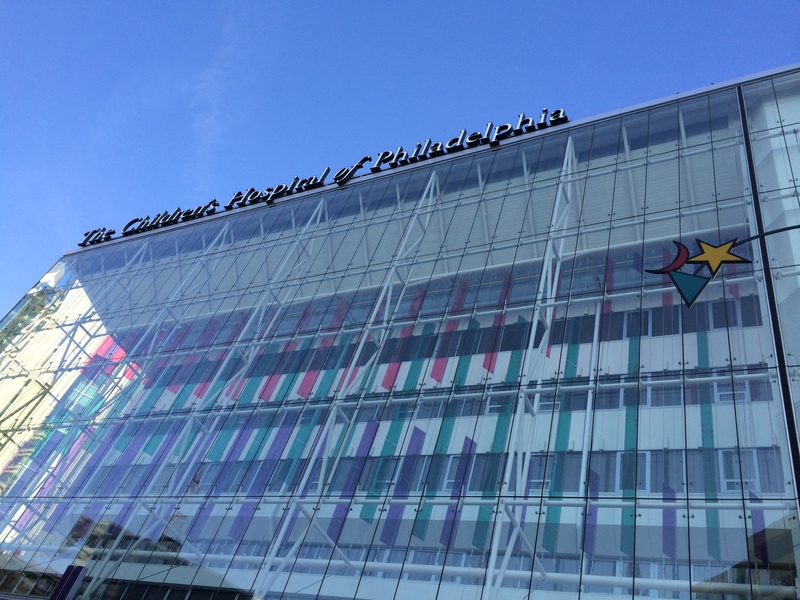 The 535-bedded hospital in central Philadelphia treats more than 1.2 million children a year through hospital admissions and outpatient visits and earned its high marks for its dedication and expertise across multiple specialties, the quality of its treatment, superior nurse-patient ratios, survival rates and ongoing research. I was pleased to be able to attend the Grand Round at CHOP this week (an 8am start with donuts and bagels) which was delivered by Professor Harriet MacMillan from McMaster University, Ontario. Professor MacMillan is a paediatrician and child psychiatrist conducting family violence research, including trials of interventions aimed at prevention of child maltreatment and intimate partner violence (or domestic violence (DV) as we refer to it in the UK). Harriet gave an excellent presentation looking at the evidence base, or lack of it, behind some of the interventions that are often used for children who are at risk of child abuse or who have suffered from maltreatment. I was even more delighted to be able to join Harriet and the CHOP CARE Team for lunch so that we could discuss the potential applicability of her work to the UK health system with a particular focus on what may be appropriate for clinicians working in paediatric (and general) emergency departments. Work published in the Lancet focussing on interventions to prevent child maltreatment and associated impairment has shown mixed results. Although a broad range of programmes for prevention of child maltreatment exist, the effectiveness of most of the programmes is unknown. The Nurse-Family Partnership, which is available in the UK, and Early Start-have been shown to prevent child maltreatment and associated outcomes such as injuries. Whether school-based educational programmes prevent child sexual abuse is unknown, and there are currently no known approaches to prevent emotional abuse or exposure to intimate-partner violence. No intervention has yet been shown to be effective in preventing recurrence of neglect. Cognitive-behavioural therapy for sexually abused children with symptoms of post-traumatic stress shows the best evidence for reduction in mental-health conditions. The research team recommend that future research should ensure that interventions are assessed in controlled trials, using actual outcomes of maltreatment and associated health measures. In serious case reviews of children who have suffered from significant harm in the UK, the toxic triad of Domestic Violence, Adverse Parental Mental Health and Alcohol/Substance Misuse are found in over a third of cases. Dr MacMillan’s team have focussed on domestic violence to determine the effectiveness of DV screening and whether it reduces violence or improves health outcomes for women (although we must remember that men, too, can suffer from DV). The team’s results were interesting and provide a focus for future work as they did not provide sufficient evidence to support DV screening in health care settings (there was no demonstrable benefit or harm) but, instead, they recommended that evaluation of services for women after identification of DV should remain a priority. What can we do to reduce the risks of child abuse? 1:3 adults in Canada retrospectively report some form of exposure to child maltreatment and thsse figures are comparable to data from the USA. What we really need to identify are those factors in society which put children at such increased risk of harm and, once those risks have been identified, we need clearly evaluated and effective strategies in place to deal with those risks to reduce the number of cases of child abuse that do occur and to improve the outcomes for those children who have suffered from maltreatment. I don’t think we need any more studies working out if poverty is a bad thing for children and families – we know it is and rather than invest further scarce funds in re-identifying that fact which has been known now for some time, money should be invested in resolving that poverty so that, as a direct consequence, it is likely that the harm which stems from it which is, of course, multi-faceted but includes an increased risk of child maltreatment, will be reduced. As I’ve travelled around the three states that I have visited so far I’ve been trying to work out what it is about the society that exists in the USA which seems to have so much more child abuse contained within it than I would ever expect to see where I work in the UK. It is not a case of us missing all of those cases in the UK, and having an artificially lower rate, but my subjective opinion having seen a shockingly large number of incredibly serious cases of child abuse over the last three weeks is that we must have lower rates in the UK as I’ve seen more horrendous cases of child maltreatment here than I would expect to see in a very bad 3 months in the UK or, more likely, in 6 months – and I’m confident that those cases I have seen here would have been identified where I work. Identification of those factors which appear to be associated with such high rates of abuse in the USA may help us two-fold in the UK. Firstly, knowing those factors will help to identify suitable sociological models which could be put into place to try to address them with the hope that this will minimise the risk of child maltreatment and reduce cases even further. Secondly, when people present to emergency departments having knowledge of what those factors are will help to guide clinicians into more in-depth targeted assessments of patients (both adults and children) where a risk factor is identified. 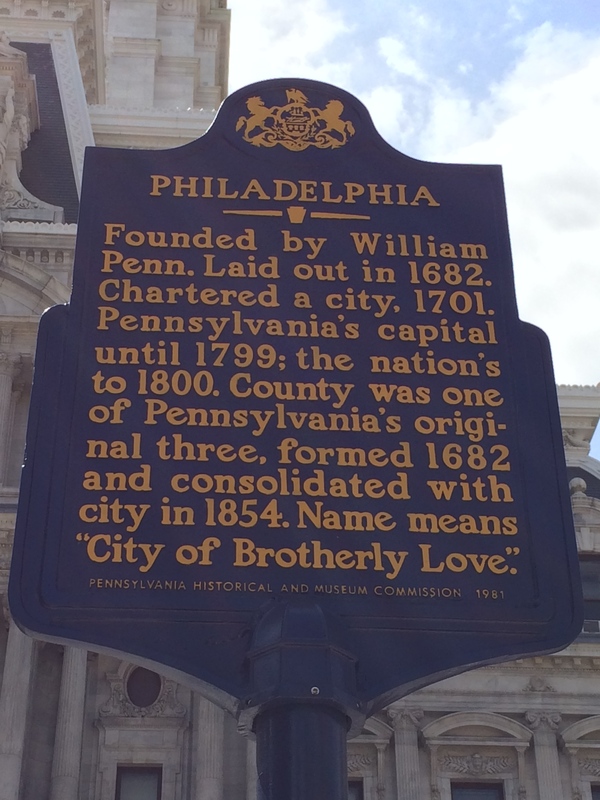 Tomorrow is my last day in Pennsylvania before I move on to Colorado, and I’m taking the day off work (after several pre-dawn starts this week) to have a look around Philadelphia to learn more about American history. 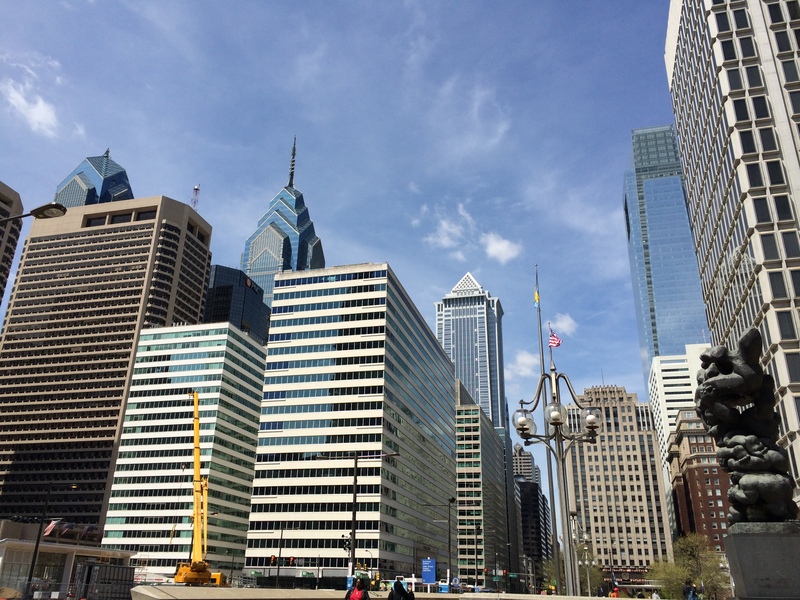 I’m looking forward to seeing Independence Hall, the Liberty Bell and sampling a Philly Cheesesteak (whiz wit) for lunch. I must remember to re-activate my gym membership when I get home in the summer…!